I was hunched in my windowless corner office nursing a double. I was dry as an unirrigated field in California’s 500-year drought. Maybe the last gully-washer knocked a few years off the rating, but I was in a dry state, no question. It wasn’t just my throat that was parched either. Business had dried up and blown away like the last tumbleweed of summer. I was rubbing some nickels together in hopes of producing a quarter when the new barista slipped a tiny pumpkin loaf in front of me. “On the house,” she said without moving her lips. I smiled involuntarily. “That’s a novel get-up,” I said, indicating her leotard top, which was long-sleeved on one side, sleeveless on the other. As her sleeve moved into a beam of light, my hand instinctively dove for the pearl-handled implement in the pocket of my trench coat. 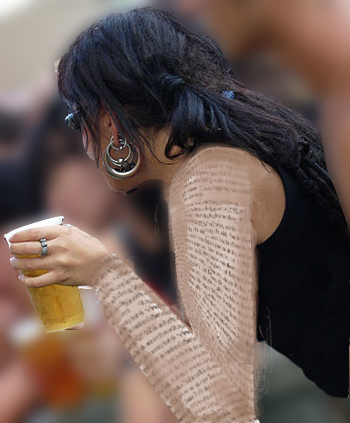 The “sleeve” was not made of cloth but tattoos – minuscule marks marching like ants around her arm. Raising the pearl-handled magnifier, I saw that the lines of ants were words – thousands of them. I gazed downward, but her boot-cut jeans kept their secret. “Well, you gave me a freebie, so this one’s on me. It’s the other way around. The adjective novel, meaning ‘new,’ ‘of recent origin,’ ‘unusual’ or ‘fresh’ entered English around 1400 from Anglo-Norman and Middle French novel, ultimately from classical Latin novellus belonging to recent times, new, young, fresh, etc., from novus new + the diminutive suffix –ellus. So I bade a temporary farewell to arms, tattooed and plain. Got a question about a word or phrase? Ask Lexie in a comment. This entry was posted in English language, etymology and tagged etymology, novel, tattoos. Bookmark the permalink.